← Starch, and meat, and fat! Oh My! Semi-winter noms: coconut chicken soup and bacon broccoli pasta. We’re moving towards spring. Not quite there yet. After the previous week’s glut of heavy rich foods I wanted something lighter but still substantial. Highs in the 40’s does feel down right balmy, but let’s not kid ourselves. I’ll break out the summer salads when my summer dresses come out of hiding. 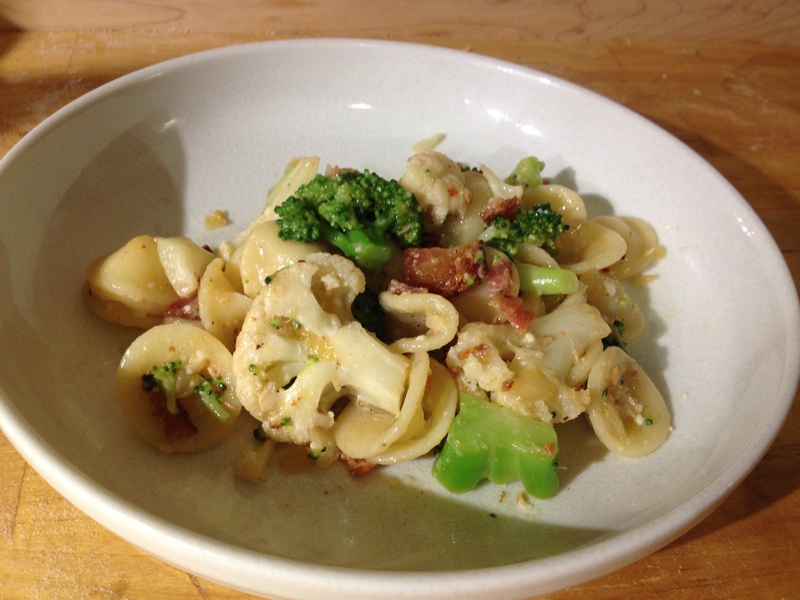 Pasta with roasted cauliflower, broccoli and bacon. I saw something like this flipping through a magazine. I can’t remember at all what it said or even what publication I was reading, but whatever I ended up with was delicious. I Started about 1/2 lb bacon going in a pan. Got heavily salted water started on the stove for the pasta and the broccoli cut up. Preheated the oven, I think it was 400 or something. Removed and chopped the crispy bacon. Fried diced onion in the bacon fat, grinding as much black pepper into it as I had patience for. Chopped the cauliflower, put on roasting pan, drizzled oil and sprinkled salt, put in oven and checked it every now and then. When the pasta was almost done, I tossed in the broccoli. As soon as it came back to a boil I drained the pasta and broccoli, reserving some of the salty starchy veggie water. When the cauliflower was tender and starting to brown, I combined everything into the big pasta pot. I stirred in enough of the reserved pasta water along with a generous amount of lemon juice and good sprinkle of romano cheese for good measure. Pretty simple ingredient list turned out super yummy. That’s it. That’s all I cooked last week. Will made Thai chicken soup in the crock pot. Over the years I’ve modified a recipe from the Food Network to make it my own. It’s become one of the few dishes that I’d consider a staple. Water so the chicken is just barely covered. Chop/shred green cabbage and stir in. This entry was posted in Kym Cooked and tagged bacon, broccoli, cauliflower, chicken, cooking, food, pasta, thai coconut soup. Bookmark the permalink.